Madley Communications Centre, a giant BT satellite earth station in the Midlands, is marking 40 years at the centre of international communications. The centre has played a central role in worldwide broadcasts of some of the most dramatic events of the past four decades – such as the fall of the Berlin Wall, the funeral of Diana, Princess of Wales, and the 2017 Hurricane Irma in the Caribbean. 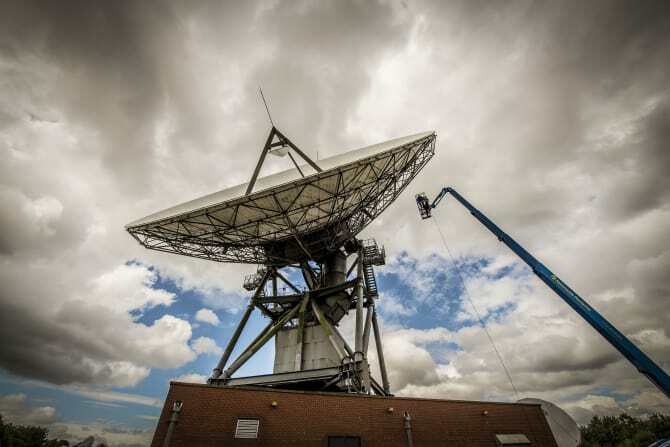 BT’s main global satellite tracking centre, Madley was constructed to meet growing demand from people and businesses for resilient international communications services. Today it handles thousands of telephone calls, data, internet and television links, specially tailored business services and a range of other communications every day to almost every country in the world. The 218-acre site houses 65 aerial dishes. It is dominated by three huge dishes, each measuring 32-metres in diameter and weighing 290 tonnes. The inaugural signal was transmitted from Madley’s Aerial 1 in the autumn of 1978, initially enabling more than 2,000 simultaneous calls to 34 countries in the Middle East and Africa in less than a second, via the Intelsat satellite, which was in orbit more than 22,000 miles over the Indian Ocean. Identical second and third aerial dishes followed in 1980 and 1981 as the site developed and the demand for even more international services grew. Since then the number of services have continued to expand, enabling even more people and businesses to stay in touch around the world, and to watch global events as they unfold on 24-hour television news outlets. From the fall of the Berlin Wall and Live Aid concerts to last year’s hurricane season in the Caribbean, specialists from Madley have played their part in creating and restoring communications around the world. The use of satellite communications from Madley has enabled families, friends, businesses and journalists to stay in touch with and communicate more easily and safely from remote locations around the world, war zones and developing countries. Madley’s hard rock base and relatively sheltered location, nestled in a bowl flanked by the Malvern Hills to the east and the Black Mountains of Wales to the west, prone to little radio interference and with relatively good transport links, made the former farm the ideal choice. Before that, it gained notoriety as the former Royal Air Force base, from where Rudolf Hess was flown to attend the Nuremberg Trials in 1945. Madley Satellite Communications Centre took around two years to design and plan, with a specialist team flying in from Japan to help with the construction of the first dish. Developments in technology have enabled more recent services to be provided by much smaller dishes, which can be built by BT engineers on site within hours. Madley was originally built to provide expansion for BT’s inaugural satellite earth station at Goonhilly in Cornwall. More than 50 staff are currently based at Madley, working in a variety of areas. As well as staff responsible for the running of the 24-hour communications centre, there are maintenance engineers, rigging teams, software specialists and project managers. Madley is also the base for BT’s Emergency Response Team, who can be called upon at any time to provide expert support to Aid Organisations, the Armed Forces and overseas service providers, principally in helping to restore communications in the wake of a range of natural disasters, such as the recent fires on Saddleworth Moor, where the team rapidly established temporary mobile communications for the emergency services tackling the blaze. The site also boasts the award-winning Madley Environmental Study Centre. Opened in 1994 and set in 15 acres, the educational conservation area – which became a registered charity in 2001 - welcomes up to 3,000 children a year. The BT teams on site will be holding a series of events to celebrate the 40th anniversary of the first transmissions on November 19. Nick Wood, Station Manager, said: “We’re proud of the central role that Madley plays in satellite communications for BT and our customers, as well as for the UK as a whole. This anniversary is about celebrating forty years at the heart of bringing world events to the UK, and helping our customers communicate across the globe. Each of Madley’s 65 satellite aerials works the same, regardless of their size. A signal is carried to an aerial, where it is amplified and the frequency converted to allow it to propagate into space. The signal is received by the satellite, which carries out signal processing and amplification (effectively acting as a technically advanced mirror) before retransmitting, down to the receiving aerial and out to the awaiting recipient of the telephone call or data transmission. As well as overseeing communications and television links from satellites, Madley’s is also BT’s international gateway for all telephone calls and communications from national telephone exchanges around the UK when people phone or communicate abroad. When someone makes an international call it will typically go through their local telephone exchange, onto the national ‘trunk’ network and into Madley’s Transmission Centre. Here all calls and other communications – such as data, mobile, text and faxes - are ‘compressed’ through International Switching Centres and into Madley’s International Telephone Exchange. It will then automatically select the most appropriate route needed to reach the final destination – via an international satellite or subsea fibre communications cable, with Madley providing access points for both. 1985: Madley transmit world’s first digital signals to satellite via ground-breaking technology, known as Time Division Multiple Access (TDMA), received at Etam in the USA and Yamaguchi in Japan – the first time two signals had been sent ‘interpolated’ onto one wire, effectively doubling capacity of communications traffic. 2017: First UHD (4K) TV Transmissions to satellite.